If there's always more zero's than it seems there will never be a limit to the amount of fiat the bankers can create. It seems they just started another round of it. If you're watching Silver Wheaton SLW it appears to have build up a floor at 30 starting on Nov. 4, 2010. The last 3 candlesticks represent extreme indecision as the longer term triangle (also representative of indecision) plays out. It is unlikely that price will simply meander out of the apex of the triangle. 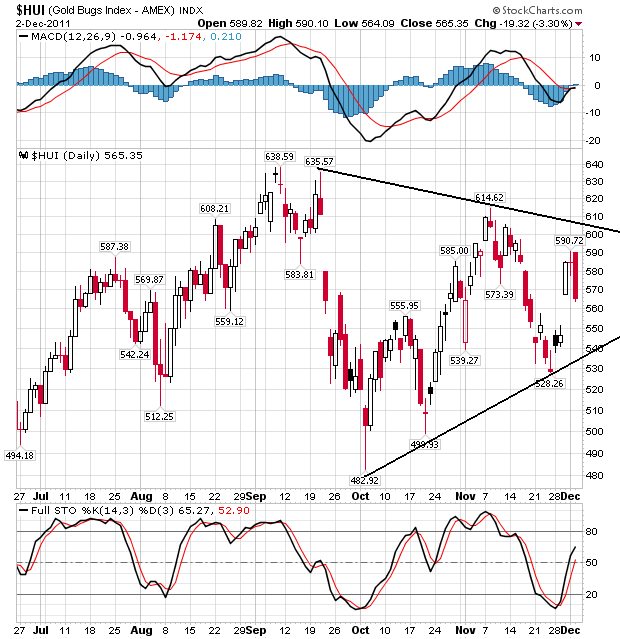 A gap fill would take price to the lower trendline on the chart above. And the cloud tells us where support resides. 1. A triangle. 70% of the time it is a continuation pattern. Bullish. 2. We know there's a gap to fill. Possibly bullish. 3. We have a rising lower trendline. Bullish if it holds. 4. 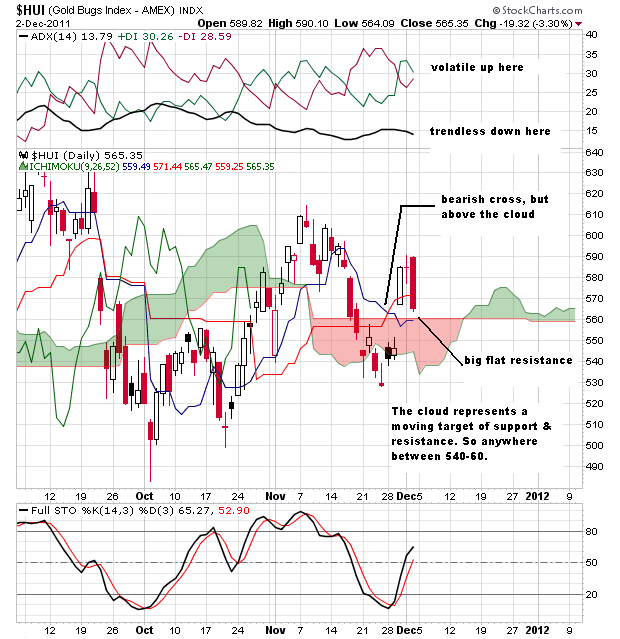 The cloud, the gap, and the rising trendline all indicate potential convergence. Bullish if they hold. So, I'm watching as a very bullish bottom could be forming. Has HUI lost 501? Nope. Nothing has happened....yet. Silver; monthly abc is completed, imo....as Alfie Field has pointed out. Armstrong is think'in sideways. Alf needs new highs to confirm his theory. I'm think'in any kind of (temp.) fix in euroland causes a pop in gold and shares but continues range bound. Typical end of year sell off for tax purposes in the US, just when do investors climb back in and where? Usually pile back in for a January pop, any dividend payer looks good now or later. Gold needs to hold the $1580 area. Silver needs to clear and hold $32.50 to portend a move on up. There is some early bird action in silver shares. Too many gappy charts need to fill first. Bankers pretty much in firm control.....for now. well meta reappears and bv is bullish! Silver peaked months in advance of gold, so I'm wondering if we can rely on it creating a supportive bottom months in advance of gold. Gold and silver usually work in tandem but not always. Most say only in the end of the bull precious metals market will silver outperform gold. Could be years away, mostly acting like copper and other industrial metals until then but a great trading metal if you can figure out the swings. In fact I would avoid industrial metals and commodities in general until some obvious and serious money pumping is needed to avoid a meltdown in world banking. Including Platinum? Now priced below Gold for the first time. Yeah, I saw that and rhodium. Both precious and used mainly for industrial needs and not known for collecting in coin form. I think the pricing is the results of deflation in a recession as the world economies slow down as a whole. Any extra money laying around either gets sucked up by debt or looks for conventional safe bets. What a horrible year, gold went up 20% and my miner portfolio went down about 40%-50%. Kicking my self for holding UXG. Finally, went to about 50% cash. Have some stuff with about 300% gain from the '08 bottom that I would probably sell except I don't want to pay the big Cap gain tax, plus I'm getting about a 3% dividend. I still think we still will have $5000 gold in the next 3 years. I hate to sell here, seems miners a so undervalued to gold they got to go up. Let me know if I'm crazy, I thought they would go up 6 months ago. Hope you all are doing better. I took the gains I wanted keeping taxes in mind. Missed a few sells and didn't bother chasing prices down. More interested in keeping the total amount of shares I own. This correction down could turn into a trend changer. Need some bottoming action or spot gold could just fall off a cliff at $1560. 25% cash in my trading account 10% in the retirement account. From today's levels, healing process would take about 6 months. How many back up the truck moments can one live through?